Any parent or grandparent will love my next Spotlight on Mom this week, as she offers an amazing keepsake that can be worn and treasured for years to come. I am speaking about Maija Pykett, creator of Smallprint Silver Keepsakes. Maija makes silver jewelry capturing children's fingerprints, hand and footprints, doodles and writing. She came up with the idea back in 2004, when her youngest son was 3 months old, and she was standing in a long line, waiting to have his hand and foot prints cast in a clay mold. Seeing other mothers looking to capture these special moments in their child's lives made Maija come up with the idea of Smallprint Silver Keepsakes -- and, thus her business began. Just look at some of the sample prints Maija has done and offers to parents and grandparents. I wish I had known about this when Savannah and Arabella were just born. Capture a precious moment in time with a unique item of jewelry hand-crafted in fine silver. From tiny fingerprints to those first drawings and doodles, we can help you cherish each and every milestone. Choose from a wide range of pendants, charms, cufflinks and keyrings and much, much, more! Treasuring memories of childhood has never been so easy and our keepsakes make the perfect present for every occasion. For a gift that shows just how much you care, take a look at our fabulous ranges. And don't forget to treat yourself too! But, now that I am aware of this amazing and unique product offering, I make sure friends and family who are expecting know about Smallprint Silver Keepsakes, in case they want to have a special piece of jewelry created just for them. With Father's Day that just passed, this would have made for a great gift for new dads. 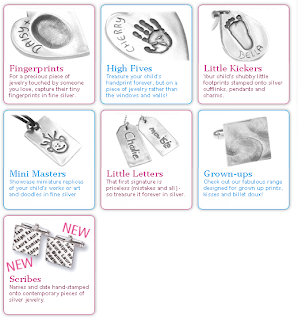 Why not consider surprising new grandparents with cufflinks or a pendant of their grandchildren. I know my parents would love this! Before you head on over to Maija's website to learn more, please enjoy my Spotlight on Mommy interview with her below. My name is Maija. I am English and I moved to the Bay Area two years ago with my husband and two sons, Dylan 11 and Noah 8. We love it here, especially the weather! I am very creative which probably explains why I do what I do and I love trying out any new craft - everything from stained glass windows to dry felting. My company logo is my writing when I was seven years old. My company is called Smallprint. 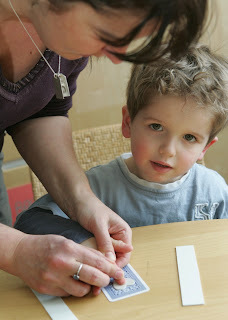 I make silver jewelry capturing children's fingerprints, hand and footprints, doodles and writing. I had the idea in 2004 when my youngest son was just 3 months old. I had made myself a pendant with my older son's fingerprint a couple of years before and wore it all the time. I had someone comment on it almost every day, but it never occurred to me that I could make them to sell as I was working for a local newspaper at the time. Then one day when I took my youngest to have his hand and footprints taken in clay and while I was standing in a long line of mother's all waiting to do the same, I had that lightbulb moment. Why not design a whole range of jewelry for mom's and dad's? And so the journey began. I spent the next six months designing the range and honing my skills. Because I had desk top publishing skills and editing I also designed my logo, brochure, packaging and website and wrote all my own copy. The first day I set up my stand in the same store I had visited to have Noah's handprints taken, I was inundated. I took over $1000-worth of prints. Within 6 months I had two friends begging me to set them up working for Smallprint - both enjoyed the same success as I had. It was then that I realized that in order to grow, but maintain the personal service I was currently offering my customers, I had to franchise Smallprint. What's more I realized it was a great opportunity of mom's like me to run a flexible business around their family commitments. I spent 2005 putting together a franchise package - everything from legal documents, an operations manual and an initial kit, through to designing a training course. Eight years later and I am Franchisor to 140 franchisees in 22 countries around the world. I still have to pinch myself to remind myself what I have achieved. The boys leave for school at 8.30 am and as soon as they have gone I sit down at my desk. I spend the first part of the day answering queries from customers wanting to have pieces made and franchisees who have questions. I am constantly playing with new ideas for our range - we started out just doing fingerprints, but now we do hand and footprints, drawing and writing. Then I might write some copy for a competition, draft a press release and Skype our franchise manager in the UK. I worked in publishing for about 15 years. I started out as a researcher for a legal magazine in London and eventually worked my way up to Managing Editor. I then branched out onto consumer titles for everything form home decorating, health and baby magazines. My last job before setting up Smallprint was a Deputy Editor for a local newspaper in Bristol, where my husband and I moved from London when we were expecting our first child. My biggest success was beginning to get franchise enquiries from overseas. Someone would be visiting England, have a piece made by a Smallprint franchisee and then get in touch to see if they could set up in their country. Smallprint's initial rapid growth was really by word of mouth. Smallprint has also been nominated for a number of awards – we even came second to Mcdonalds for international marketing which was a huge achievement. Any small company that grows quickly will struggle with resources. I have often worked late into the night simply because there was work to be done and no one else to do it but me. Now we have a great team at head office in the UK and here in the US, so that makes life easier. It's my business - working for yourself is motivation enough. What I put in I get out. What's more I have a responsibility to my franchisees to grow the Smallprint brand. Also seeing the look on people's faces when they see their piece of jewelry for the first time is priceless. And then there are the pieces I have made for people who have lost a child… what a privilege to give someone help at such a difficult time. That is undoubtedly for me the most rewarding part of what I do. I am lucky. My business is family friendly in every way! That is the beauty of it. I can work from anywhere and I decide when to take time off. We travel quite a lot with our boys, but my laptop goes with me and once they are in bed, out it comes. But somehow working on my laptop with a glass of wine in my hand watching the sun go down doesn't always feel like work! We plan to grow the business here in the US, offering other moms like me the opportunity to create gorgeous silver keepsakes for customers and call it work! Keep going, it will be worth it. If you are struggling, take a look at what you have done so far and see what works and what doesn't. Stop doing the thing that isn't working. Take a look what other people are doing and do something different. You need to differentiate yourself in a world where there is too much choice and too much information. Focus on what makes you different. I love reading the background information for artist moms - its so great to see what inspired them to start their businesses. These pendants are great. What a great idea I love this for myself but it would also make a great gift. My daughter just got something like this with my grandsons fingerprint and his birthstone attached. I love these!